This post is part of “Words go here.” A series about writing’s role in product design. Do you have a side gig? An idea for a novel you’ve never written? Awesome, we’ll come back to that later. Now the big one: are you afraid that AI will take your job? If you’re a UX writer, you may worry it’ll take “the writing part”. Not so! Let’s discuss. At its core, AI is math. And lots of it. AI is a research field, and ML is a type of technology within that field. An ML-based algorithm analyzes a bunch of data, finds patterns, then makes predictions about new data, based on what it learned from the analysis. Theoretically, it gets better at this over time. For writing, the easiest way to see this in action is when a smartphone’s autocorrect picks up patterns in the words you type, and predicts which words usually come next. This, of course, is not the same as writing, and it can sometimes come off as unhelpful or weird. However, there are ways in which these predictions can be super helpful for actual writers. But let’s start at the weird part. There are many funny articles about writing only using your mobile phone’s autocorrect feature. This is most intriguing when algorithms suggest things like “I love you” as a closing sign off in response to lunch invitations. Writers and researchers who work on these systems have to flag “I love you” as something not to suggest. Even though the algorithm is picking up that this is a high probability phrase, it’s not right, and like, very awkwardly not right. Just because you say it a lot doesn’t mean you want to say it all the time. That makes sense, right? It does to you, but it doesn’t to an ML model. A machine wrote a book based on the most popular aspects of the collection of Harry Potter novels. Bananas, right? How did a machine-learning model write a book? So weird. Let’s explore. The ML Harry Potter book was actually based on a huge database of writing. Writing by a human. Without that, you couldn’t have ML Harry Potter. For machine learning to actually produce content, it needs a whole lot of information, or data, to learn from. In short: to write a book, an ML model needs a huge database of words and phrases, exactly like the book you intend for it to write. To generate meaningful phrases, the algorithm also needed labels for important functional elements — like protagonist, villain, etc. With the help of people who can label the words with actual meanings, books can become training data for an ML model. In the world of ML, the Harry Potter series isn’t actually very much data. Which is why the story was so very inhumanly incoherent. All the algorithm could do is predict which words usually follow other words in the context of these specific novels. To make these ML-predicted word strings hang together, the story “was constructed with the help of multiple writers, who edited the sentences generated through a combination of algorithmic suggestion and authorial discretion.” So, in short, the ML Harry Potter was written by a bunch of (I’m sure very giggly) writers with an undoubtedly high penchant for Mad Libs®. In order for AI to actually write like a person, it would need to come up with an idea, or a story that it wanted to tell. It would need to generate narrative. It would need to set up emotional tension, dramatic highs and lows, cause and effect. You know how to tell a story to other humans. In fact, you can assess a situation, an audience, or a person, and figure out what kind of story will help foster understanding within them. You can tell stories that haven’t been told yet — ML can only return remixes of ones that have. For writers, what part of your job is really tedious? Are there any parts that are unreasonably hard, boring, or inherently uncreative? For me, it’s remembering pre-established, researched, patterns for a specific user context, then writing for those standards. For that stuff, I’d love a reminder of a story that’s already been told. I could definitely use a suggestion for the best, most deeply-researched way to write error strings for a particular server malfeasance. It would be nice to have a program that could recommend a selection of pre-approved error strings that are standard across my company, that I can check, lift, drop, tweak, and be done with. It could be up to me to decide when and where these examples or suggestions make the most sense. Then, I wouldn’t have to go and dig up that research deck from another team that proved that a particular phrasing is actually clearer. That would be rad. And that job can be done by ML. But first! It’s up to us to write the story for it to learn, so it can then give it back to us when we need it. You have to decide the best way to communicate to people. You have to figure out the most interesting analogy, the simplest language, and the clearest prose. As a result, you get to create something glorious. Since we (writers and designers) are the keepers of the stories, the only jobs that AI can take from us are the ones we want to give away. You can teach a machine what writing is, but it can’t write a UI, description, or article on it’s own — it needs your ideas first. However, with a little help from ML, you can enjoy the benefit of having the stuff that should be uniform and perfect, be uniform and perfect. What one could do, to make one’s life a little easier, is create a very useful database of well-designed strings, and use ML to recommend a couple good candidates for your situation. This would be most useful for strings that are best standardized — the ones you don’t want to spend a ton of time reinventing. Once you have this set of standard strings, you could label them based on what makes sense for each context in your UI. Those labels can help teach an ML model which strings make sense for each context. In theory, you could use this dataset as your testing data to generate string suggestions for a couple predictable scenarios. You would basically have a pre-programmed set of standard options that your ML can generate for a narrow set of situations. That’s about how much good writing ML can do — it can serve up what you already put in, ideally at the time and place when you need it again. So where does that leave us when writing with AI? Let’s think about this with a handy metaphor. You know how your microwave has a potato or a popcorn button that helps you cook those things pretty effectively and uniformly? Instead of using several kitchen implements and waiting a long time, you can put these things into a microwave, and press a button — it already knows the best time and temperature. The machine can pretty much guarantee a decently cooked potato. This is what a database of strings can do for you: it can give you a standard set for a given scenario. This is useful because I don’t want to have to re-learn how to microwave a potato. I’d like it to be perfect on the first try, so I can avoid potential potato explosions, and because potato is one element of a delicious dish. Similar to how a single string is one element of your entire UI. For those boring simple ones, it would be nice to press a button and have those at least halfway done. Now that you have the boring and predictable part done, you can really get wild. Personally, I’m going to use that microwaved potato as a base for something delicious and interesting that my microwave has no idea about. It doesn’t know what dish I’m making, and it doesn’t know for whom I’m making it — I, the chef, i.e. user experience creator, know the end product and the user journey. The microwave just knows that for potatoes, heat on high for 4 minutes, stop, then do the same thing again. ML the boring stuff so you can write even better. C. Are not inherently creative. An algorithm doesn’t have narrative laced through it, just as your microwave has no idea what those freakin’ potatoes are for. Having some part of the job done easily, correctly, predictably, and programmatically can loosen us up to get even more creative. If you don’t have to spend time boiling potatoes, what are you doing? Perhaps, when you’re not reviewing very boring strings for consistency, you’re out there keeping users safe in other ways. (1) Defining the voice and tone. (2) Designing the information architecture. (3) Labeling the most valuable parts of the content. (4) Coming up with new ways to present information. (5) Scaling good, tested, consistent, UX writing to more products so more people have access to information around the world. 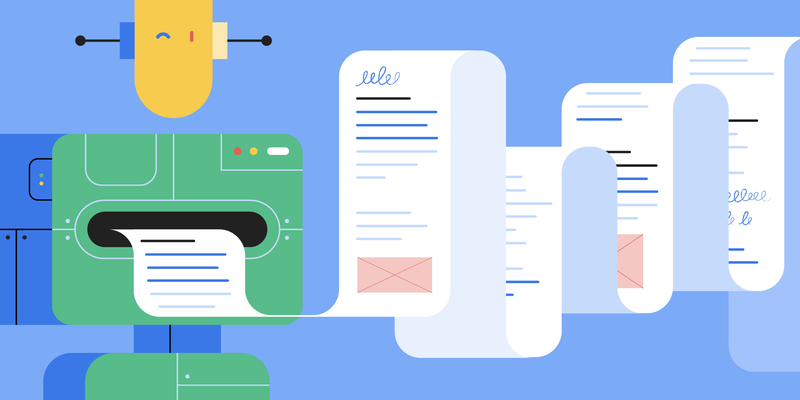 You can also ensure that the UX writers of the future, who will also be ML writers, are thoughtful, prepared, and empowered to do great work for the benefit of users. So that’s it! That’s why AI isn’t taking your writing job. It could actually make your job way easier, while opening up time for the creative, explorative, fun work that your brain is really good at. So you can let the machines do the little stuff and get back to writing that novel.